Have you been making wrong choices in your personal or professional life and experiencing unnecessary pain? Listen to Dr. Arlene�s Call-In Shows and learn how to find the Right Fit without searching for the �best.� Curious? Start listening to the shows and discover the simple secret. This show is the second in a two-part series on Core Identity. On WIN Without Competing, Dr. Arlene will explore the relationship between passion and risk in her guest interviews. Many do not follow their passion because they are terrified of taking the risk. Are you following your passion? If not, why not? Those that are passionate about pursuing their Right Fit Core Identity use passion to propel them, pushing fear into the background. Some do this early in life, others later in life. Should age be a factor in following our passion? During the show, be sure to take Dr. Arlene's Core Identity Passion/Risk Assumptions Quiz to find out what erroneous assumptions you are making which can prevent you from changing Core Identities. To learn more about finding your Core Identity right now, read Chapter Four -- �Your Core Identity: Know Thyself Now� in Dr. Arlene�s book WIN Without Competing! This show is the first in a two-part series on Core Identity. On WIN Without Competing!, Dr. Arlene will strike the Core Identity Nerve in her guest interviews. Picture an apple with a core. With the precision of a surgeon, Dr. Arlene will cut the apple in half, in order to examine its core. In her conversations with her call-in guests, she will probe to reach the essence of their unusual Core Identity transformations. For many, changing Core Identities is a daunting task coupled with fear. For others, it is a joy. What about you? Have you found the Right Fit Core Identity? During the show, be sure to take Dr. Arlene�s Core Identity Assumptions Quotient Quiz to find out what erroneous assumptions you are making which can prevent you from changing Core Identities. To learn more about finding your Core Identity right now, read Chapter Four- -�Your Core Identity: Know Thyself Now� in Dr. Arlene�s book WIN Without Competing! On WIN Without Competing!, Dr. Arlene will demonstrate how her Right Fit Method gets even more personal when she uncovers how secret erroneous assumptions about our personal lives can be detrimental to achieving and maintaining happiness. During the show, you can take Dr. Arlene�s Secret Assumptions Quotient Quiz and find out what erroneous assumptions you are making about your personal life that you do not want to share with others. You will also discover why you should not be making these assumptions. With her guest co-host Virgil Holder, Director of Corporate Recruitment, at the prestigious Piedmont Healthcare System in Atlanta, Georgia, Dr. Arlene will share fascinating stories about the impact of making erroneous assumptions in our personal lives. Dr. Arlene will respond to callers� questions and speak with guests who have unusual personal stories. She will demonstrate how the Right Fit Method, the subject of her book WIN Without Competing! is the key to figuring out the right solutions not only in your professional life but also in your personal life. A Conversation/The Veil of Email: What is Your Email Assumptions Quotient (EAQ)? On WIN Without Competing! Dr. Arlene will ask, �Are you hiding behind your email inbox and wondering why you are not achieving your professional and personal goals?� To find out if you are consciously, unconsciously, or automatically using email to avoid speaking on the phone or face-to-face, take my Email Assumptions Quotient Quiz. You will be amazed to learn how many erroneous assumptions you are making about the effectiveness of email. My guest co-host Virgil Holder, Director of Corporate Recruitment at the prestigious Piedmont Healthcare System in Atlanta, Georgia, and I will have an eye-opening conversation with many �eureka moments� which will change your perception of when to use or not to use email. 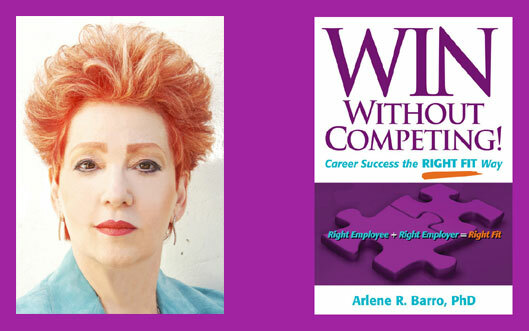 Dr. Arlene�s Right Fit Method, the subject of her book WIN Without Competing!, is the key to figuring out the right solutions (including emailing) in your professional and personal life. The Right Fit Method Gets Personal: What is your Personal Assumptions Quotient (PAQ)?� On WIN Without Competing! Dr. Arlene will demonstrate how her Right Fit Method gets personal and disclose when erroneous assumptions about our personal lives can be detrimental to achieving and maintaining happiness. During the show you can take Dr. Arlene�s PAQ Quiz and find out what assumptions you should not be making and why. Dr. Arlene, with her guest co-host Virgil Holder, Director of Corporate Recruitment at the prestigious Piedmont Healthcare System in Atlanta, Georgia, will share fascinating stories about the impact of making erroneous assumptions in our personal lives. Dr. Arlene will respond to callers� personal questions, demonstrating how the Right Fit Method, the subject of her book WIN Without Competing!, is the key to figuring out the right solutions not only in your professional life but also in your personal life. On WIN Without Competing! Dr. Arlene will host a special call-in career show with guest co-host Virgil Holder, Corporate Director of Recruitment of the prestigious Piedmont Healthcare (includes five hospitals) in Atlanta, Georgia. More than 15 million people are currently unemployed and millions of employed are shaky about their jobs and careers. Fear can cloud our judgment and prevent us from acting appropriately. Fear coupled with erroneous assumptions is deadly. To find out if you are making erroneous assumptions that are preventing you from getting a job, changing careers, or moving up in your current position, take Dr. Arlene�s Assumptions Quotient Quiz during the show. You will be amazed to find out the number of erroneous assumptions that you make which impede your career success. Are you blasting your resume from Burbank to Bombay? If so, be sure to listen to the show. Dr. Arlene will respond to callers� questions, demonstrating how her Right Fit Method, the subject of her book WIN Without Competing!, is the key to figuring out the right solutions to succeed in both your professional and personal life. Would you like to be a guest on Dr. Arlene's next Special Call-In Show? Email her after you have listened to the shows and tell her why you should be a guest.